Baked Cod Puttanesca is such a quick and easy recipe we’re almost embarrassed to post it. But we found the dish so delicious, we just had to share. 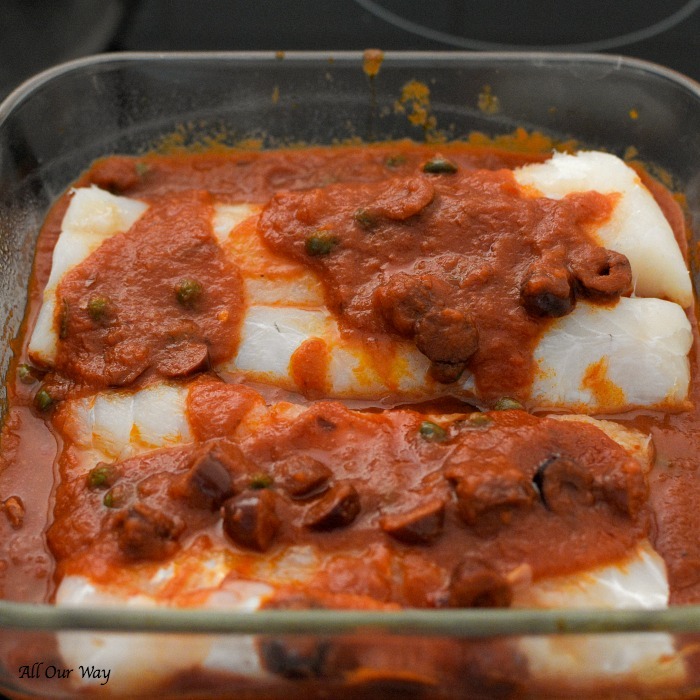 Picture this, cod fillets bake on a bed of a spicy tomato sauce that’s boosted in flavor with kalamata olives, capers, anchovies, and red pepper flakes. There are so many types of seafood that you can bake. We like using cod fish because it’s reasonably priced. When you think of cod, how do you think of preparing it? Fried, right?! Okay, to be honest, it’s delicious fried (isn’t everything? ), but we enjoy baked cod just as well. We’ve made Baked Cod Puttanesca, no less than five times in the past two months. Believe me; we’re still not tired of it! 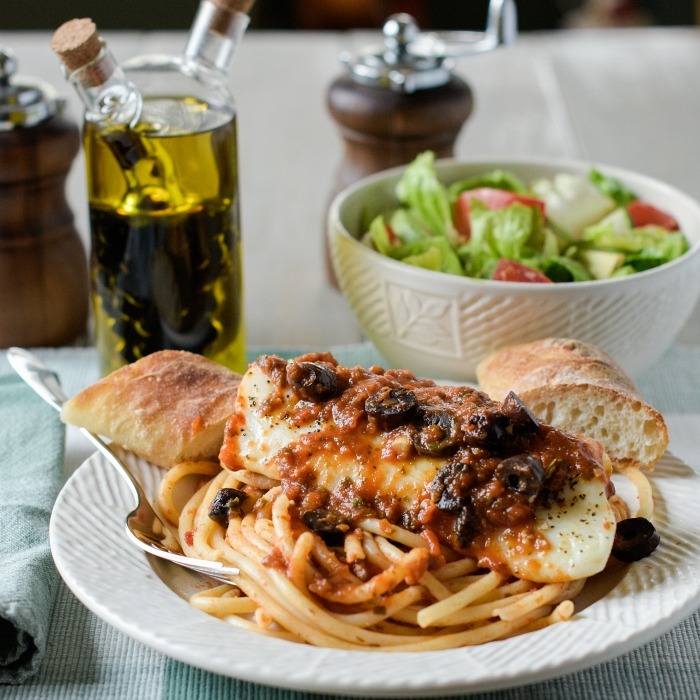 We don’t know why we never thought of making the cod with a puttanesca sauce before now! The shortcut we use for our baked cod is to start off with homemade marinara sauce. When we make marinara sauce, we make a LOT of it. We freeze it in quart containers, and although it’s great by itself, it’s a fantastic springboard for other recipes. We’ll be posting our marinara recipe soon and additional sauces you can make with it. Now, if you don’t have any tomato sauce made up, use your favorite jar variety. I won’t judge. I’ll admit to opening up a jar or two in a pinch. ? In a pan, sauté some anchovy in a little olive oil. Now, don’t turn up your nose at anchovies. You can’t taste them, and it gives the sauce a deeper flavor. In fact, the anchovies melt away in the oil. Next, you add a few red pepper flakes to the oil and after about 30 seconds pour in your prepared tomato sauce. Once the sauce warms up, add the sliced Kalamata olives, and capers to the pan. Pour the sauce into an oven-proof glass dish. We preheat the oven to 400 °F. Before seasoning the fish, blot the cod with paper towels to get some moisture out of the fillets. Baste the cod with olive oil, then salt and pepper to both sides of the fillets (q b – quanto basta). Arrange the fillets on top of the sauce then transfer the baking dish to the oven and bake until the fish cooks, about 10 to 15 minutes. Top the fish with the puttanesca sauce. Be sure to have some Pugliese bread or our ciabatta; you’ll need a scarpetta (bread slice) for soaking up the sauce. You can serve the baked fish over pasta but we’ve also served it over farro, or even just with toasted artisan bread on the side. Believe me; your family won’t complain when they get a taste of this delicious baked cod puttanesca. Un caro saluto è alla prossima. Be sure to sign up for our newsletter – we have lots of exciting posts coming up. 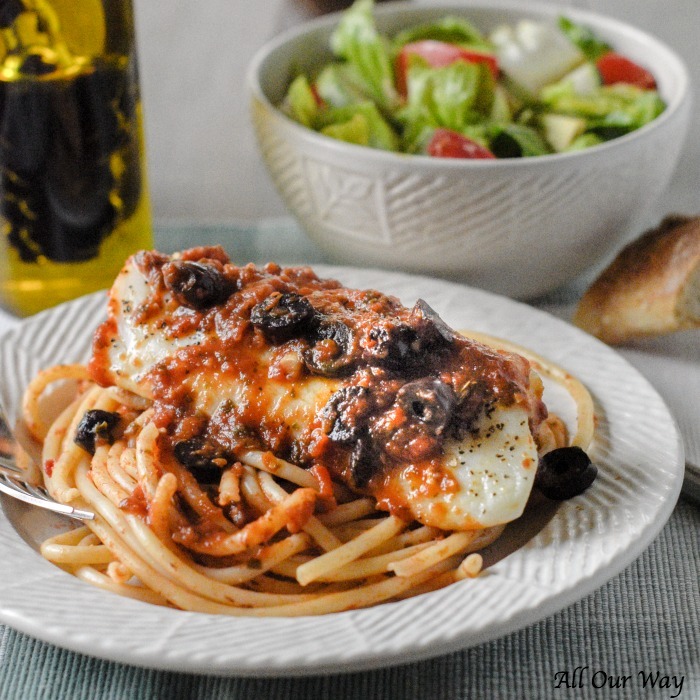 Baked cod puttanesca is an quick and easy seafood dish that uses prepared sauce and makes it spicy by boosting it with kalamata olives, capers, and red pepper flakes. Full of flavor but low in calories. 4 cod fillets (about 1 1/2 inches thick 6 ounces each. Optional: 4 1-inch-thick slices ciabatta bread brushed with olive oil and baked in oven until golden brown 10 minutes. Meanwhile, heat 1 Tablespoon olive oil in a sauté pan over medium-high heat. Add the anchovies and cook, stirring often, until the anchovies break down, about 2 minutes. Add the pepper flakes and continue to stir. Pour in the prepared marinara sauce and heat to a simmer. Add the olives and capers and simmer for 2 minutes. Prepare the cod by using paper towels to blot the excess moisture from the fillets. Brush the fillets on both sides with olive oil. Season the fish with salt and pepper. Pour the sauce in a glass oven proof casserole and place the fish on top of the sauce. Spoon a little bit of sauce over the fish. Transfer the casserole to the oven and bake until the fish is just cooked through, 10 to 15 minutes. ** see notes. Serve with pasta, farro, or bread topped with the fish and puttanesca sauce. ** Depending on the thickness of your fillets, it may take a little longer for the fillets to cook. The flesh should be white and flakey. Note: Recipes and content from © 2017 All Our Way are copyright protected. Please do not use content or recipe without prior written permission. If you want to share the information please link to this post. Grazie. This was a great recipe. I adapted with a good quality black sole, and cooked the fish on a bed of Zoodles. Skipping the olives as my family is not a fan and dbl. the capers! This is such a good idea! I don’t eat enough fish because I’m always at a loss as to how to prepare it. I love olives and capers so this is my kind of dish. Can’t wait to try it! This looks sooo delicious Marisa! We usually default to salmon when it comes to fish but I think that should change! 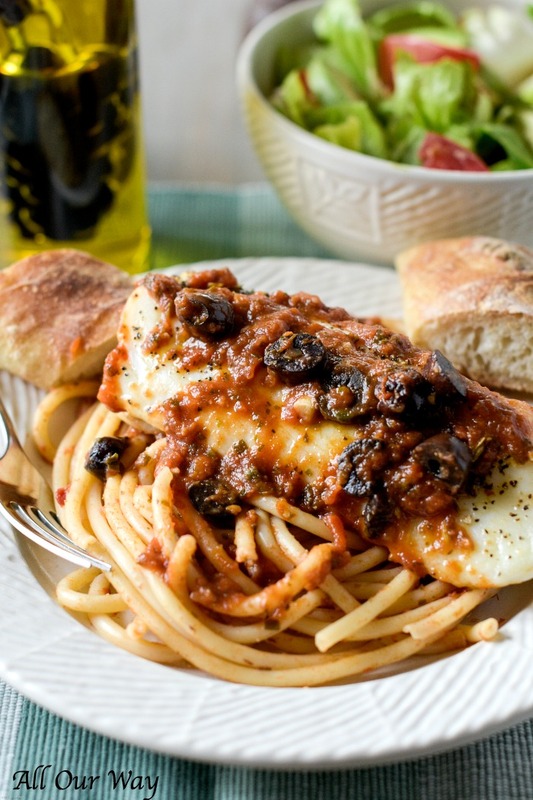 Cod with the puttanesca sauce is perfect together. Looks delicious. I LOVE puttanesca sauce. This is the perfect dinner for entertaining with. 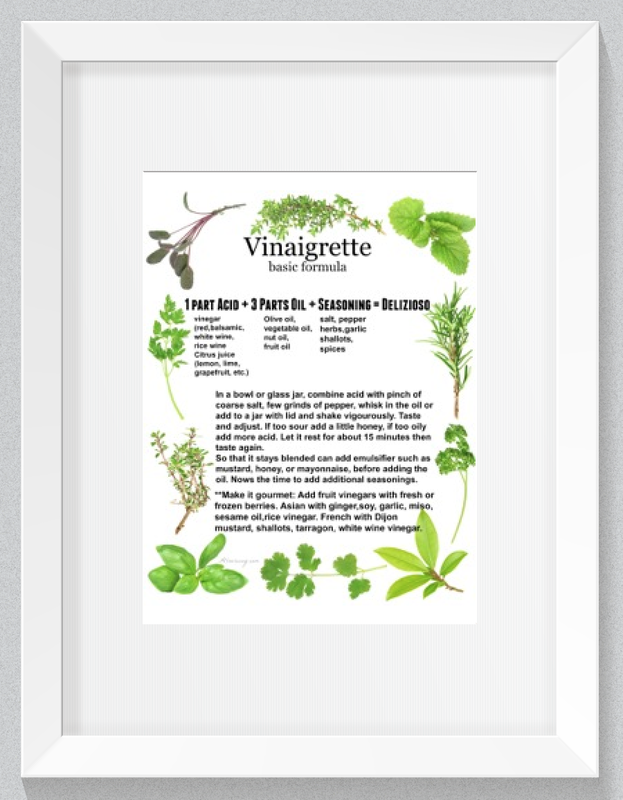 Add a nice glass (or two) of white wine…and ENJOY!! I can eat pasta every day!! You made cod so tasty. They don’t like to take up spices while making the curries so I make only fries with coated spice. Your recipe is so easy to put together. I am going to try as I can try new way of using up my cod fillets. Okay I can see why you have made it so many times!! It sounds amazing and I love the sauce (yes even the anchovies!!). There is nothing better than a super quick meal when you just don’t feel like cooking all night. Delish! I love baked fish and this sounds so absolutely divine. I LOVE how simple and easy this is to make. 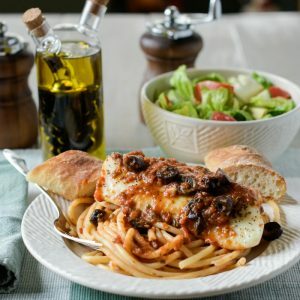 I love olives and this is definitely my kind of dish. I think this will be one of my favorites for dinner. This looks amazing! I cannot wait to give it a try. Thank you for sharing this great recipe. YUM! Just love these super simple recipes with just a few ingredients that pack a punch of flavor. Perfect recipe for the Holidays and beyond. This sauce sounds so rich and flavorful! Cod is the perfect fish to choose to pair it with – it’s so versatile! My family will love this recipe! I have to say that the concept of pairing Puttanesca with cod fish rocked my world! I grew up in an Italian family and my grandmother cane from a small town near Naples. 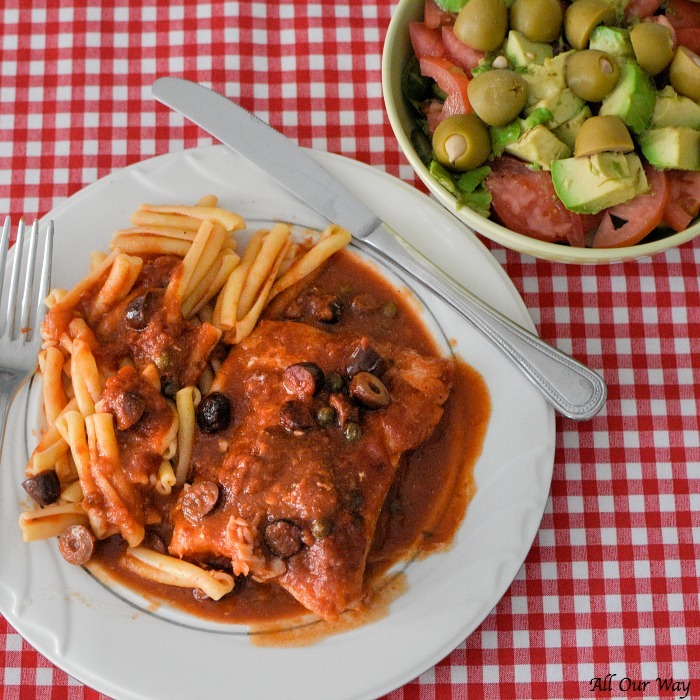 My grandmother and aunts often made cod with a light tomato sauce, but never took it beyond that. I love to cook and this recipe will now be a regular staple in our family. I live in Boston and we are fortunate to have lots of locally caught cod here. made this tonite and it was soooo delicious. Ciao, Tony!!! I am so glad you enjoyed the cod. Yes, it is good isn’t it. We do a lot of fish recipes because we do like fish but also Hubby likes to ocean fish. So!! When he’s lucky we get lots of freshly caught fish otherwise we have to rely on the store. Check out our cod with mushrooms and vermouth. That is another standard in our house and it’s really good. Have a great Independence Day — what are you cooking up?? I love puttanesca. Such a quick and easy sauce to make. We are pasta lovers here. Pairing fish and seafood makes for a delicious meal. Bring on the wine…and dig in. Hi, Gloria! If you like fish this is one great recipe — and super easy too. This cod looks delicious, Marisa! Thank you, Sasha! I hope you try the recipe. What a delicious way to liven up the flavor of cod. It’s such a mild fish, that these flavors are just the right accent. Brava. Grazie, Linda! We couldn’t believe how good it is. I bet you have some delicious homemade marinara sauce somewhere in your house. ? Extremely wonderful. <3. it was good time to read this recipe. Thanks for sharing this. My brother is a fisherman and is always giving me fresh fish. I usually make fish tacos with it but next time I’m making puttanesca because this looks amazing! Thank you, Christine! This is a taste everyone can love. Let me know how you like it. This recipe couldn’t come at a better time……I just bought cod filets……I can’t wait to try this recipe……Thanks, Marisa, for another inspirational and delicious recipe. Hi, Susie!! Hope you like the recipe. We’ve made it down south several times and up here too. Grab your favorite marinara sauce and go! Have a great Easter. Hoping to have some picture of the kids and grandkids to share. Happy Easter to all of you! xoxoxo to you too ? You may say simple, I say WOW! You always have recipes I’ve never heard or thought of! Looks soooo good!! I’m pinning it for later, I’ll let you know when I try it! Hi, Elizabeth! It sure is easy to throw together, do let me know how you and your family like the dish. Do you have Ellie’s outfit for Easter? What a delicious way to serve fish. Looks wonderful Marisa. I like that you served over pasta. Hi, Jovina! Puttanesca screams for pasta, don’t you think? We will definitely try it with other fish.